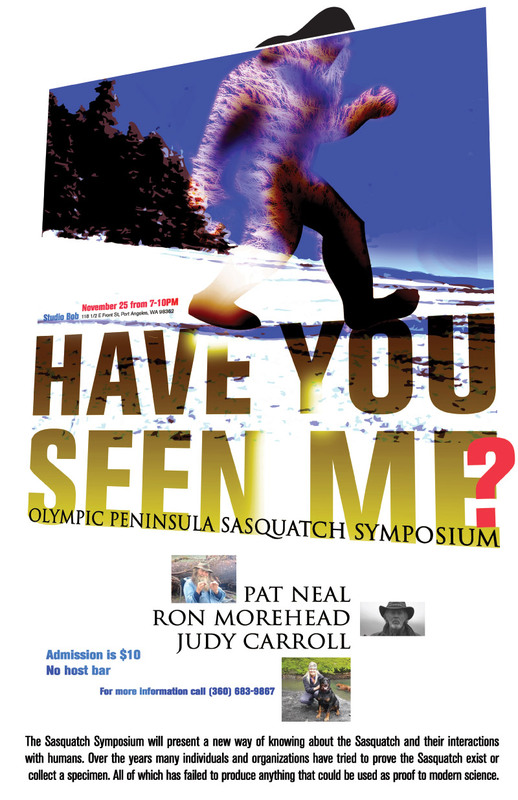 Studio Bob in Port Angeles will be hosting the Olympic Peninsula Sasquatch Symposium on November 25 from 7 to 10 Pm. The Sasquatch Symposium will present a new way of knowing about the Sasquatch and their interactions with humans. Over the years many individuals and organizations have tried to prove the Sasquatch exist or collect a specimen. All of which has failed to produce anything that could be used as proof to modern science. The Sasquatch Symposium is not an effort to prove the Sasquatch exists. Anyone who has ever seen a Sasquatch already knows they exist. The Sasquatch Symposium reflects the personal interactions between the Sasquatch and the people who have attempted to communicate with them. Neal is a columnist on the opinion page of The Peninsula Daily News, a Hoh River fishing guide and former historian for the Washington State Office of Archaeology and Historic Preservation whose research concluded the Sasquatch have been here as long as humans have. In his thirty years as a fishing guide floating the rivers of the Olympic Peninsula Rainforest he has had numerous occasions to observe his client’s reactions to seeing the Sasquatch while out on what they thought was a normal fishing trip. Their reactions range from shock, fear and total denial that they even saw what they saw. Neal will describe the history of the Sasquatch on the Olympic Peninsula and read from his new book, “Wildlife Volume Three, Fishermen’s Holidays,” about the failed efforts to document, explain and exploit this wild and mysterious phenomenon. Very few researchers of his caliber are brave enough to publicly consider the hundreds of reports that include that “spooky action at a distance,” (Einstein). In his new book, “The Quantum Bigfoot,” Ron goes above and beyond, combining decades of experience and tireless hours of research into the realm of quantum physics as it could pertain to Bigfoot/Sasquatch. Besides being the Keynote Speaker at many conventions, he has been featured on countless radio programs such as Coast to Coast, BBC TV documentaries, and the Learning Channel. An avid hiker of the Olympic and Cascade Mountains whose experiences with the Sasquatch motivated her to discover a whole new way of documenting the activities she has personally witnessed. Carroll presents a new way of knowing the Sasquatch. She will share her own adventures in communication and interaction that will provide a unique perspective of the Sasquatch personality. Carroll’s research demonstrates that the Sasquatch are shy sentient beings capable of abstract symbolism, humor and forgiveness. In last week’s episode Edward is sent out on his job as a biologist to check a smolt trap where he finds himself confronted by a large hairy animal approaching in the twilight. The creature comes nearer, breaking logs and making grunting noises that shiver the hair on the back of Edward’s neck. The beast staggers out of the woods and looks directly at Cullen, who by this time is shaking like a leaf. It is definitely not a bear. It’s on two legs and bears don’t walk on two legs. The face is shaggy with the appearance of bangs. It has almost no neck. The shoulders are stooped with long dangling arms that might almost define the term knuckle-dragger. It carries a forked stick with a steelhead hanging off it, the tail dragging in the mud. That, with the hip boots, ball cap and fishing vest stuffed with beer cans allows Edward to quickly identify the creature, a steelhead fisherman. The Boss Biologist had warned him there would be days like this. Now Edward would have to engage in what had to be the worst part of anyone’s job, dealing with the public. It was a cycle of abuse. The fishermen hated the biologists because the biologist wouldn’t raise enough fish and the biologists hated the fishermen because there was just too many of them. The steelhead fishermen were part of a lost tribe of primitive people who still inhabit the dark corners of the rainforest. They fished through the brutal winters in an attempt to catch the rare steelhead. As the steelhead became more rare, the authorities constricted the steelhead fishermen into smaller and smaller areas where overcrowding caused the same sort of social anxiety and habitat degradation that has been exhibited in lab rats. All of which made talking to fishermen a difficult and often pointless exercise in a form of ritualized marathon cursing called a “rigging fit” that could blister the paint off a humvee. Luckily Edward had taken a class in how to talk to the locals in their own dialect, a fast-talking form of pidgin American, punctuated by a lot of spitting. “Wan bir?” The steelhead fisherman said. It was a good sign, that Edward might be accepted on the river. Edward had to think fast. To say no to beer might raise suspicions. If Edward was to operate and not blow his cover it might be best to give the impression that he was constantly inebriated. Luckily he had a cover story he’d learned at the biologist academy. “Na, diwi.” Edward said, shaking his head. Hoping an alibi about getting busted for driving while intoxicated might give him enough stream cred to get away with not having to drink a canned beer. Edward said not wanting to explain how he’d just had his fangs cleaned. The steelhead fisherman drew closer, drinking, spitting, smoking and smelling like the fish that just slimed him from head to toe. “Cupla slackbellies.” Edward lied, momentarily forgetting that he was holding a shotgun instead of a fishing pole. “Conk ’em,” the redneck said, obviously OK with Edward shooting the fish or however he got them on the beach. Leaving Edward to seeth in his vampire rage at being offered a canned beer. He’d get even with those steelhead fishermen if it was the last thing he did. He vowed to stuff that creek so full of log jams you couldn’t throw a rock in it so forget about fishing here anymore. Edward went home with the feeling his enemies had fled before him. These days it seems fewer and fewer Twilight fans are making the pilgrimage to Forks. With the commercial success of the Twilight book and movie series, the once proclaimed logging capitol of the world had morphed into the vampire capitol of the universe. I remember the good old days when hoards of soggy teenagers huddled in the rain in front of the “Welcome to Forks” sign while the rest of the family who’d been drug from across the country and around the world, waited in the car. Waiting, to find the rest room facilities, cash machines and drive to LaPush and hassle the Indians about what time they were going to turn into werewolves. All of which startled the locals until they figured out the Twi-hards were tourists and the season was suddenly opened year-round. The next thing you know there were Twilight camp firewood bundles. I’m not bitter. Just because the Twilight phenomenon boom thing didn’t work for me. Even though I was the only fishing guide on the Peninsula to offer a Twilight Fishing Fantasy where for a limited time only with additional fees and service charges, the Twi-hards had the once in a lifetime opportunity to go fishing with Edward and Bella. OK, maybe they were just cardboard reproductions of the Twilight characters but I sell dreams, of hooking silver fish in blue water while partying with the latest Hollywood heart throbs. Things went OK on the first Twilight Fantasy Fishing trip. Unfortunately the Twilight figures were not waterproof. I should have known better. Then there were the other fishing guides, whose uncharitable remarks only revealed how bitter they were about not thinking up the idea first and the delusional Twi-hards who wondered if we were going to catch a 100-pound salmon. I said it was a good day to try. Instead we snagged into a spawned out bull trout that tore off downriver like a runaway shopping cart to where the river dove into a brush pile called, “The Tunnel of Love” in the brochure. That’s where tragedy struck. Edward and Bella failed to execute a crucial limbo move. They got ripped and laid together in the bilge for an eternity or the next trip to the dump I don’t remember. So I retired from the Twilight industry. Looking back I realize how wrong it was to prey upon the deranged fantasies of city slickers who were convinced they were going to see a werewolf swinging on a vine around the next bend of the river with a big old vampire on his tail. Instead I decided to devote my life to sharing with our tourist’s friends the experience of seeing a real creature, the Sasquatch. According to the Bigfoot Field Research Organization, Washington state leads the nation in Bigfoot sightings, at 525! Most if not many of these reports were not sightings of me walking in the woods. The BFRO has a TV show called “Finding Bigfoot” on the Animal Channel where they hunt for the creature with gangs of people and high-tech gadgets. You cannot hunt a Sasquatch. Your only chance to see one is if they are hunting you. To attract a curious creature, you must exhibit curious behavior. Pat Neal meets the Manis mastodon at the Museum and Arts Center of the Sequim-Dungeness Valley on West Cedar Street. Thank you for reading this. If you don’t, no one will and we would be deprived of the luxury of your criticism. I think it was the famous Greek philosopher, “What’s His Name,” who said, “Criticism is easier than craftsmanship.” I should have known better than to criticize the biologists. I can offer no excuse for saying that these brave scientists would profit from the extinction of the fish, whales, birds or any other organism they happen to be studying. I’m probably just bitter for not being a biologist myself. I could have been a crackerjack biologist except for one thing: the 4th grade. That’s when they hit us with the new math, which I didn’t get. The math teacher said pie are square when anyone knows pies are round. Blackberry cobblers and apple crisps are square. Math is the language of science. I had to take off my shoes and use my toes to count beyond 10. So I became a fishing guide where each number is divided or multiplied by a factor of two, depending on who you are talking to. It was only by accident I became a wilderness gossip columnist, a bottom feeder in the shady underworld of print journalism, spewing misanthropic venom in a crude attempt at humor. That was no excuse to tar all biologists with the same wide brush when it’s really just the 90 percent of them that give the rest a bad name. Just because I am a fishing guide is no excuse for me to be angry about the fish going extinct. The worse fishing gets, the more you need a guide. And besides, why should we care about fishing for salmon for our own food when there’s canned tuna at the food bank. It’s an historical fact that extinction is a way of life on the North Olympic Peninsula. It began shortly after the last ice age near Sequim, where archeologists discovered the remains of a mastodon with a spear point in its rib. One theory suggests that an exploding population of Stone Age hunters in the new world was responsible for the extinction of the pleistocene mega-fauna, the mammoths, giant bison caribou and other species that once roamed this place. Doesn’t matter, they are gone now. Our next big extinction occurred when the American Capt. Gray traded some iron chisels for sea otter skins at the mouth of a river he named after his ship, the Columbia. This set off the treachery and slaughter of the fur trade that wiped out the otters and many of the Native Americans who hunted them. Spanish explorers were sure the Strait of Juan de Fuca was the Northwest Passage connecting to the Atlantic Ocean because of the abundance of all types of whales, including blue, sperm and humpbacked. James Swan visited the Strait of Juan de Fuca with an eye to build a whaling station but Victoria, British Columbia, beat him to it. As man moved inland the larger land animals went extinct. In 1885 Lt. Joseph P. O’Neil reported large herds of tame elk in the high Olympics. They had never seen man. By the 1900s the elk had been wiped out by market hunting, thrill seekers who massacred entire herds and the trade in ivory elk teeth for a gentleman’s watch fob. To preserve what was left of the elk, the wolves were hunted to extinction in the 1930s. Meanwhile, with the invention of the soldered tin can, the fishing industry took off. The question isn’t why are the salmon going extinct on the Peninsula but, why did it take this long? It was another tough week in the news. The dreaded emergency closure reared its ugly head and stopped us from fishing many of our beloved rivers flowing into the Strait of Juan de Fuca. Emergency closures are not a new thing. The way our fisheries are managed there is always an emergency somewhere. While emergency closures because of low numbers of fish have become a common management tactic, it’s interesting to note that there is never an emergency opening of a fishing season because of a sudden abundance of fish. Rumors of the current emergency closure were first heard back in December when government biologists said there were low returns of native steelhead in rivers running into Puget Sound. How the biologists knew there were low returns in December when the native steelhead don’t generally return until February is anyone’s guess. Predicting the numbers of returning fish is an inexact science based upon a number of factors like smolt traps where the baby fish migrating downriver and out to sea are counted. This is a lot like counting your chickens before they are hatched, except an unknown number of smolts are killed in the smolt traps, but as they say you can’t make an omellette without breaking a few eggs. With the recent budget cuts, shutting down the fishing season just seemed to make sense to people who don’t fish. After all, if no one is fishing, you don’t need fish cops or fish checkers or anyone to sell the licenses or count the punch cards. The emergency closure worked so well on the Puget Sound Streams that it was decided to try it on the Strait of Juan de Fuca. In addition there are rumors of more emergency closures on the Chehalis River system. This of course has all been decided before one fish was actually counted. The actual numbers of fish don’t really matter. All that is required is to have the fish declared threatened and or endangered. Then the gravy train of federal funds will flow and the fish restoration industry can work its magic. I can think of no finer example of this phenomenon than the Dungeness River. Once called the finest spring steelhead river in the state, the Dungeness had huge runs of humpies, spring Chinook, chums and silvers. Now, after 20 years of Dungeness salmon restoration, these same fish are rare, endangered or just plain gone. Today the Dungeness, a river with two fish hatcheries, is closed to fishing most of the year. It all began with the simple emergency closure. Anyone who was not a willing seller risked having a biologist knock on their door to declare their home as bull trout habitat. Many then quickly became willing sellers. Their homes were then bulldozed, thrown in the landfill and replaced with native vegetation. The river was then landscaped with engineered log jams tied together with steel cables, which made it impossible to fish even if the season was open. The Dungeness is not unique. Coincidentally, all of the other streams that were just closed to fishing because of the “emergency” have been “restored” in much the same manner with the same dismal results. The endless repetition of a failed experiment has been called a form of insanity. I call it salmon restoration. If I had but just one wish, I would be a biologist. What could be better than to wake up in the morning and spend your days playing God with the ecosystem. Heck, I’d work for free if they’d just buy fuel for the Humvee, ammunition, gill net, crossbow, bullhorn, dart gun, spotlight, harpoons, party barge, pepper spray, seal bombs, radio collars and electroshocking device. All you need to be a biologist is something to study and a big bag of money. The possibilities are endless. For example, the Japanese whaling industry depends on biologists to study whales so that the whales can continue to be slaughtered for research. The biologists recently published the results of their research on 4,500 whale carcasses and discovered an interesting fact: the whales are getting thinner. The cause could be global warming or over-fishing but we will need more studies to determine the exact cause. Anything the Japanese can study, we can study better. Say what you want about the economy but government grants continue to fall out of the sky like manna from heaven. America is still the land of opportunity where you can study anything you want. National Park Service biologists recently studied the ear bones of 100 bull trout from the Hoh River. Bull trout are listed as an endangered species that is so rare, that if you should accidently hook one you must release the fish without taking it out of the water. The ear bones or “otoliths” record the life of the fish like the rings of a tree. Otoliths are like flight recorders of the migration from the river to the ocean and back. Unfortunately, to study otolith you must cut it out of the bull trout head, which kills them. That’s research for you. Even the small fish are not immune to the biologists study. Biologists love to electro-shock streams because the results are so immediate and dramatic. Electric current stuns the fish so they float to the surface where they can be counted, measured and even implanted with electronic tracking devices. Unfortunately electro-shocking the fish can have serious side effects from burns to killing fish eggs where they were laid in the gravel, deforming the spines on baby fish and making large fish more vulnerable to predators. We’re studying the problem. Rare and endangered species of birds are not immune to study. The marbled murrelet and the northern spotted owl have been outfitted with cute little transmitter packs that track their every movement and compromise their ability to survive. Coincidentally, populations of these rare and endangered birds continue to decline, even inside Olympic National Park. Now a biologist wants to stick a transmitter on the dorsal fin of a Puget Sound killer whale to see where they go in winter. That sounds like fun but do we really need to stick a whale and risk enraging or infecting them to answer that question? Puget Sound orcas prefer king salmon. Don’t we all? Except for the immature blackmouth, there are no king salmon in Puget Sound in winter. The whales follow the fish. Find the fish and you’ll find the whales without torturing them. Maybe it’s about time someone studied the biologists. Perhaps someone could get a Federal grant to fit biologists with a small, color coordinated collars that would record their every movement with GPS satellite accuracy along with rates of respiration, temperature, blood-alcohol levels, drug chemistry as well as valuable polygraph data. I think it is an idea whose time has come. We’ll thank ourselves later if we do the right thing now. Sometimes I think that if you didn’t read this no one would. I know because you send me such wonderful messages. It might be time to review the letters policy for a wilderness gossip column. Even the most significant expressions of human thought can appear confused if not downright scary when they are presented in a disorganized fashion. Remember “Kill” is spelled with two “L’s” and “U” is spelled Y-O-U. Use a little more glue on those letters you clip out of the bass-fishing magazines. Even the most heartfelt expressions can be difficult to read when they are in a jumble at the bottom of the envelope. Work on your scissor skills, that’s if they still let you have sharp objects. Even if they don’t and you are nothing but a glue-sniffing bass fisherman just remember, your opinion counts as much as the next guy. When leaving me a telephone message please include your own telephone number with the cursing and heavy breathing if you wish to have your call returned. I am not a clairvoyant. If I was then it might have been possible for me to produce a more accurate long range weather forecast of the viscous winter we are now experiencing. Some of the more uncharitable readers have recalled that this was the winter that I predicted would be wet, warm and mild. Now that the governor has declared the state of Washington an official federal disaster area with hundreds of thousands of homes without electricity and uncounted millions in property damage it might be time to review my own winter weather prediction methodology. This is not an exact science. Based as it is on the appearance of spiders in the fall, the thickness of the husk on an ear of corn, the amount of wax on a winter apple and the fat on a buck’s back. These observations are valuable weapons in the prognosticator’s arsenal that leave little margin for error. Still weather prediction errors do occur. I blame the government. You have to shoot a buck before you can check the fat on his back. Here in Washington, we manage our game in a way that tries not to hurt anyone’s feelings. So we protect the varmints and leave the hunting season open half the year. Then we wonder why it’s so hard to get a deer. This year it took me all season to get a buck. Even then it was an accident. I was cleaning my rifle. I didn’t know it was loaded. The rifle went off and hit a deer. I tried to take him to the vet. The operation was a success but the patient died. There was a celebration of life, a barbecue. The old rutting buck was tougher than grandma’s army boot. He had a swelled neck and an empty belly. The tips of his horns were broken off and big chunks of hair were ripped out of his hide from fighting. Even worse, there were two other bullets and buckshot in his carcass. This guy had been through the wars. No wonder there wasn’t a scrap of fat on him. He was so tough you couldn’t get a fork in the gravy. As for the corn husks, we had such a dismal summer last year a lot of the corn didn’t ripen. It was the same with the apples that flowered in the spring before it was warm enough for the bees to pollinate them. Still I should not have misread the spiders. The abundance of their webs is a sure indicator. But they spun their webs too early and by the time I went to count them, the wind was blowing too hard. Given this prognosticator’s record, all I have to say about the rest of the winter is it’s not over yet. My last episode emphasized the importance of patience when fishing for the winter run steelhead. This is a waiting game. First you must wait for the rain to raise the rivers enough to get the fish upstream. So you wait for it to rain, but then it’s a flood. A flooding Hoh River can come up three feet in an hour until it’s 10 times the size it was the day before. Making it look like a gigantic chocolate milkshake with some trees floating in it. Fishing is out of the question on a river that can take out Highway 101 any time it wants. You have to wait for the high water to drop. You want the rivers low enough to fish. You’ll need a spell of cold weather for that, with crisp mornings in the ‘teens. This is winter fishing at its finest, except the fish become sluggish in the cold. They’ll hardly wiggle when you hook them. Sometimes a frostbit steelhead will just sort of swim right up to you like they want you to put them out of their misery. Once the edges of the river and the surface of the slower holes start icing up, fishing becomes a whole lot tougher. Back in the last century we used to fish the canyon below the Elwha Dam for winter steelhead. It’s funny how back then, in the 1960s and early ’70s the Elwha River was one of the top steelhead streams in Washington. Then something happened. The fish on the Elwha went from being food to Endangered Species. We’re still studying the problem. The river was freezing over. That did not stop us from climbing down into that canyon. Where, in order to land a steelhead you had to skid it over a ten foot section of ice that was too thick for the fish to break and too thin to walk on. Many a hefty lunker released themselves on the edge of the ice before a rapt audience of expectant onlookers who dispensed their helpful remarks with the certainty that you would never land the fish. These were plunkers. At the time I was plunking with them. It wasn’t my fault. Heck, I started out just fishing for sea-run cutthroat with worms. One day I went fishing with some plunkers. They started catching fish and before I knew it, I was a plunker too. It’s not something you have to be ashamed of anymore. Plunkers are people too. Plunking is a stationary method of fishing that allows you to fish in the worst weather. It makes me madder than a pepper-sprayed protester to hear how plunkers are nothing but a bunch of lazy drunks who throw a rig out in the river, sit in their truck and do beer curls. Fishing while intoxicated may not be a crime in Washington, (yet) but driving or even having an open container in your vehicle is. Drinking and driving on the North Olympic Peninsula is stupid. The Washington State Patrol sends its new troopers up here to toughen up on the loggers. Once the loggers get done breaking in the new troopers, you definitely don’t want to get pulled over by them. You want to mind your manners in town too. The fact is it’s a bad idea to drive at all in this weather unless it’s absolutely necessary. Maybe we all need a little more patience. I’m going to wait till it warms up to fish.